In this thrilling story full of adventure and romance, Sleeping Beauty is more than just a lonely princess waiting for her prince—she's a brave, tenacious girl who never backs down from a challenge. With vampire-slaying talents that she practices in secret, Sleeping Beauty puts her courage to the test in the dark of night, fighting evil as she searches for a way to break the spell that has cut her off from her family. In a special twist, readers have the opportunity to make key decisions for Sleeping Beauty and decide where she goes next—but no matter the choice; the result is a story unlike any fairy tale you've ever read!Sleeping Beauty: Vampire Slayer is an entirely new type of fairy tale–one that will keep today's kids guessing and offer them hours of magical fun. 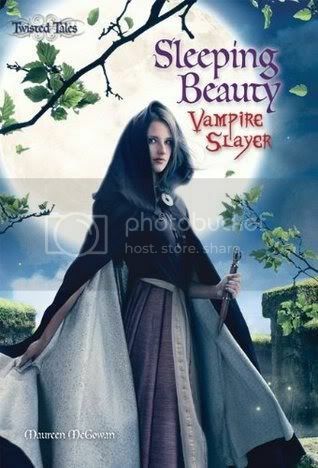 Sleeping Beauty: Vampire Slayer is a retelling of Sleeping Beauty. But it's nowhere near the same Sleeping Beauty you remember from your childhood. This telling has vampires and slayers, and a lot more action! This book also lets you chose your own adventure, which is a lot of fun! Princess Lucette, aka Sleeping Beauty, was cursed by the evil Natasha, Queen of Sanguina, the Vampire Queen, when she was just a baby. If the princess is ever to prick her finger, the curse will make her sleep during the day, and be the only one in her kingdom awake at night. All of the villagers in her kingdom are also affected by the curse, and will sleep all through the night, only waking the next morning. Since the vampires from Sanguina are awake only at night, this poses a huge problem, as there will be no one awake at night to protect the princess. The princess has to learn to defend herself, and her kingdom. Only true love will break the curse, but how in the world can she meet guys at night, when everyone else is asleep?? Read the book and chose your own adventure to find out! Thank you to NetGalley, Silver Dolphin Books and Mrs. McGowan for allowing me to read and review this book! Happy Reading! I read the Cinderella one by McGowan and thought it was so adorable. Definitely good picks for young readers. Love it! I haven't read any of these but it sounds really interesting. I like retellings.